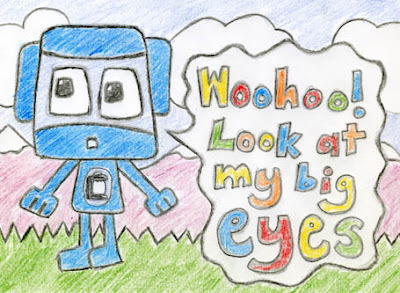 It’s a picture of yourself with big eyes saying “Woohoo! Look at my big eyes.” I put some snow capped mountains in the background to express your sense of wide eyed wonder at your new found ocular exaggerations! It’s a powerful piece, although I’m sure you can see that for yourself - even with your pitifully small eyes! No offence! Cornelius P Hankerton. Aged 19. Thank you Cornelius for your kind words about my post. It’s always nice to be appreciated. And thank you for your artwork. I’ve always wondered what I’d look like with big eyes, and now I know. I’d look like a big old nerd! Budclicks! Listen Up In Style! Spot the Difference! Hypno Macsot!